Everyone can have hours and hours of puzzle fun with this book that includes hundreds of quick and easy ways to teach and learn about the Bible. See the Bible in new ways, refresh your memory of Bible facts, or quiz your family, friends, or Bible study group! Use it with kids on long trips. Great for rainy days too! Packed with hundreds of word searches, maze games, crosswords, and fast facts. 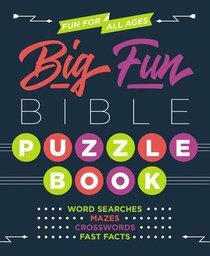 Big Fun Bible Puzzle Book will provide hours of enjoyment for everyone! Word searches, mazes, crosswords, and fast facts for a wide range of ages. About "Big Fun Bible Puzzle Book"
Customer Reviews For "Big Fun Bible Puzzle Book"
My teenagers and I love this book. I usually pop it in the basket to take along to church for if the kids get restless. It has codes, mazes, crosswords (some require looking up Bible verses for the answer), word search, etc. They are all Bible themed. Fun, engaging and a good way to pick up Bible knowledge. Also, it's quite thick, so good value for money.